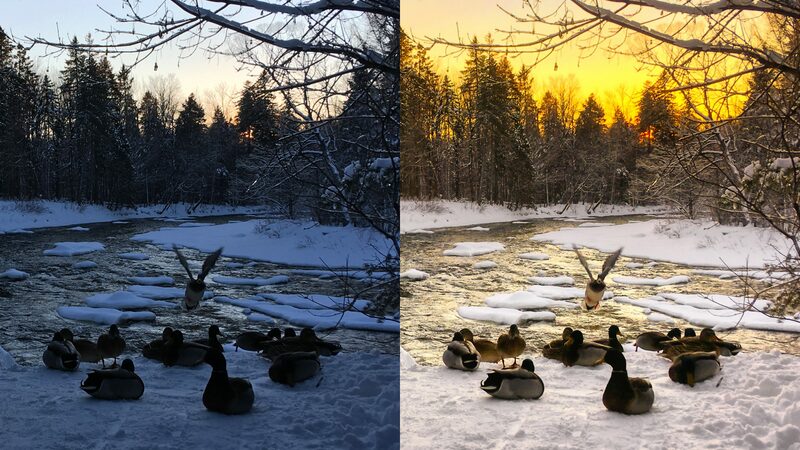 Have you snapped some lower resolution images with your smartphone and you’d like to give them a little (make that BIG) kick to catch all the attention on social media? Here’s a 2-minute trick to go from flat to fabulous. Whether you are an amateur or a pro photographer, we all end up taking pictures with our iPhone or Android at some point. It’s always with us, always ready, even when we are not! Understand that I do personally prefer taking pictures with my camera when I plan to take some. Sometimes, however, wonderful and unexpected things come into sight and a 72 dpi JPEG ends up better than nothing at all. That’s exactly what happened to me last week. I went out for a walk with my husband — where walking was obviously the only thing implied. It was a beautiful winter sunny day and the air was refreshing. It was late afternoon, 3:30 here in the great white north as we were walking back, I saw the gorgeous sunset and suddenly wished with all my might that I’d brought my camera with me. The colors were amazing! They reflected on the snow and through the ice. Then I remembered I’ve brought my cellphone (I’ve got an old iPhone SE). Using a powerful Raw editing software for … humble purposes! Aurora HDR 2019 is software with professional capabilities created to obtain professional results … but hey, nothing prevents us from using it with our “images of a lesser quality” (the photography police haven’t knocked at my door yet I assure you). Even though shooting Raw definitively matters when it comes to developing an image, we can still make remarkable enhancements to our compressed JPEG with good software. Of course, there will always be fewer details in those images than the ones we would get with our digital cameras. If our purpose is simply to put them on social media, it won’t matter that much and most people won’t see the difference. Here are 4 examples of low-resolution JPEGs taken with my old iPhone then processed in Aurora HDR 2019. This is not a tutorial as I won’t guide you step by step over all the details of my editing. It is rather a quick overview of what can be achieved with little effort in a short amount of time despite a compressed and limited format. I liked how the trees created a triangle right over my subject while the glow of the sunset breaks through the branches on top of the frame. My goal: Bring up exposure and warmth. How I got the look: In the Essential collection, I selected the Natural Look then very slightly adjusted the exposure filter to brighten my subject. This one’s been pretty much a two-click deal. This is a great example showing the devil living in the details. I loved how the ice on the branches was being backlit. It was amazing in person. It is pretty in this image — but it would’ve been 10x better with my camera. Still, I like how it came up to life nicely once edited. My goal: Bring out the branches details, add a little warmth and contrast. How I got the look: Still in the Essential collection, I selected the High Contrast Look and added more red, orange and yellow saturation in the HSL filter. This is my second favorite shot. The sky was absolutely gorgeous and I simply love the leading lines of the fence. How I got the look: In the Landscape collection this time, I went for the Better Skies Look to which I added even more saturation and vibrance. This image isn’t even close to any great bird photographer’s but I thought it was a lovely sunset winterly scene. The before/after is definitely my favorite edit of all. Amazing how colors change the ambiance and perception or an image isn’t it? My goal: Bring up exposure, details and exaggerate general warmth to create a fire-like sunset. How I got the look: I went back to the Landscape collection and chose the Realistic Landscape Look which is great go-to preset (Skylum calls them Looks) for any kind of landscape image. I then completely turned down the blue color slider in the HSL filter to remove any cool color.